Aimed at young people, their parents, carers and families, and everyone working in palliative care services. 'talk about change' is based on conversations with children and young people with life threatening conditions, made at their homes and in children's hospices. It features their own video diaries that give real insight into their lives. 'talk about change' is an essential dvd resource for children, young people, carers and families and everyone involved in palliative care. It has been designed to stimulate discussion, communicate what young people really think and want, and to help professionals develop appropriate services and responses as children begin to make the leap from children's palliative care into adult services. 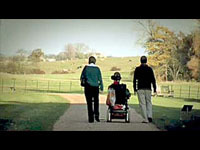 See also conversationstoremember, a video production with people dealing with end-of-life issues. ACT is the national charity working to achieve the best quality of life and care for children and young people with life-threatening or life-limiting conditions.